On Monday, 25th of July, we started out from Sagar, M.P to come to Gurgaon. This is our sixth time doing this trip between Gurgaon and Chennai. We have made many friends on the highway and found some amazing places to eat (Ofcourse!). 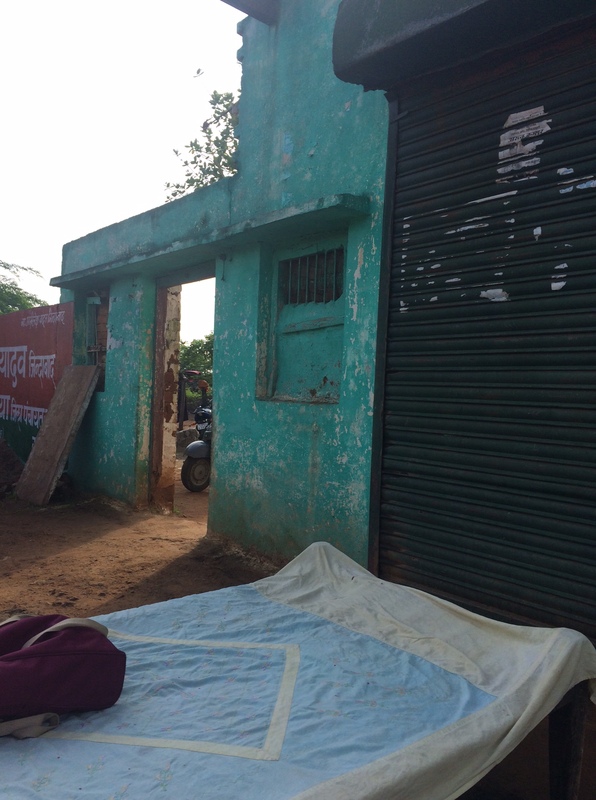 One such place is Mukesh Yadav’s dhaba just after the Babina toll plaza. We have stopped here nearly 4 out of the 6 times that we have done this trip – the food is excellent, fresh and the place is spotlessly clean always. Our plan was to leave Sagar around 6 a.m and stop at Mukesh’s shop to have tea and breakfast and then get going. We did leave as planned and reached Babina around 8.00 a.m and stopped behind a huge truck on the opposite side from Mukesh’s dhaba. We saw that there were no customers at his place and we were just wondering if his dhaba was closed for the day when we saw Mukesh and one of his helpers walking across to our car. He had seen the car and came across to say that the shop was getting cleaned so no food or tea was being made. Even before we could feel disappointed, Mukesh immediately asked us if we can come to his house which was just 50 meters out and have tea and breakfast !! We readily agreed and walked with him to his house, carrying the “lemon rice” that Amma had made as well. He immediately pulled out chairs and a “charpoy” for us to sit and started to make tea. While walking towards his house, he had told the milkman to drop off some milk at his house. He hooked up the gas connection, started to make tea and I handed him the lemon rice to heat slightly. Our practice was always to bring some food to him, so I told him to keep some of the rice for himself and give us some. He told us about the village, Nayi Basti, which is just off the highway and has about 300 people living there. They have a primary school and children go for high school in Babina. The strangest thing was that there was full 3g coverage in this village but no electricity ! They have had no electricity for the past 25 years. I immediately took pictures and uploaded on Twitter to share with Mr. Piyush Goyal, the MoS for energy and a star performer of the Modi Govt. Haven’t heard back from him, but hopefully this village is also part of his drive in rural electrification. We got tea in huge mugs… yes, overly sweet since I forgot to tell Mukesh to go easy on the sugar and the lemon rice got heated and served. While we were eating, he went to his shop to pick up his dad. After we finished eating and drinking tea, we told his helper that we will see him at the shop and started to walk down towards the car. We wanted to give some money for his young children, so when we saw him coming towards us, we immediately stopped him and said thank you and Krishnan gave him the money…. and yeah, he refused to take it. I told him it wasn’t for the tea but for his children and he said “you bring them whatever you wish to when you come next. I won’t take any money from you. You are a guest at my house.” He walked us back to the car, touched my mother’s feet, even called his friend who takes care of the shop in his absence, Tupkan, who immediately came over to meet us with his little daughter…. it felt like we were meeting family and not some roadside eating joint’s people. Mukesh doesn’t know if we will ever go back that way, he is not rich, but the genuine warmth he showed us just left a very warm feeling in our hearts. There are amazing human beings out there who do make you believe in humanity all over again …. who care about you as a human being and not just about the business you can give them or the money they can make off you. God bless Mukesh and may he do well in his business. We will be meeting him again in Oct and hopefully by then there is electricity in his village – with people like him, they don’t really need electricity for light but well !